It is #NationalBreakfastWeek in the UK and we have decided to celebrate by sharing our favourite nutritious recipes to help you survive the busy school day. If you’re a teacher overloaded with assessments, or a busy parent juggling work and school runs, check out these tasty recipes to give you and your kids the best start to the day. We’ve even included some gluten- and lactose-free options. High-quality granolas can make a serious dent in your budget, but they are – in fact – really easy to make at home in (almost) no time! Mix your favourite cereal flakes (rye or gluten-free oats if you are gluten-intolerant), nuts and fruit (fresh or dried) with a sweetener of your choice (be it honey or maple syrup), bake it for around 40 minutes (remember to turn the mixture around mid-way) and… voilà! You now have a jar full of delicious granola you can add to any type of milk or yoghurt. For more details instructions, check this recipe from Green Kitchen Stories or this one from Mama.Papa.Bubba. These are really easy to make, too and the dough can be prepared ahead of time (in the evening perhaps?) and transformed into healthy muffins in the morning. Take a squash or a sweet potato, grate it, add eggs, cheese (optional) and flour. Sprinkle with your favorite herbs or spices and bake for around 45-50 minutes in a paper-lined muffin tin. 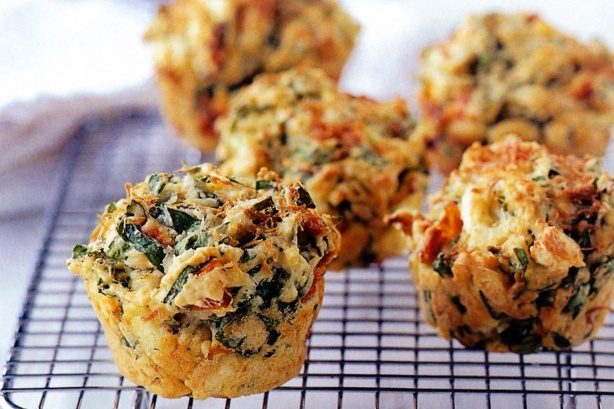 Experiment with ingredients to find our favourite version – here are some recipes to start you off: Jamie Oliver’s sweet potato muffins and these feta and spinach ones from Emma Braz. These come in countless options. The basic recipe uses just bananas and eggs (serious time saver! ), but you can try throwing some gluten-free flour in (coconut works great), skipping eggs or adding a bit of milk (try almond or oat to boost the taste). Once the dough is ready, fry small pancakes using a non-stick pan 2-3 minutes on each side. Place on a plate and get creative! Decorate them with maple syrup and fresh fruit or try adding a bit of fresh cream and a spoonful of jam. 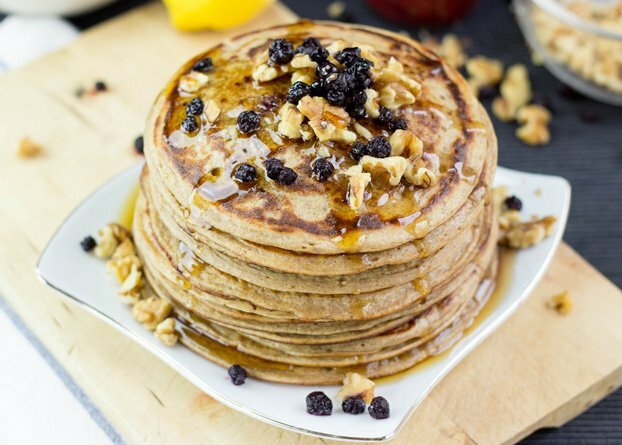 Banana pancakes can work equally well as a Sunday treat or a work-day quick breakfast. Shakshuka was once a traditional dish prepared in North Africa and the Middle East, but with the growing interest in food coming from these regions in the past years, the recipe has evolved a lot and now there are at least few ways to make Shakshuka adjusted to your needs. Vegetables like peppers and tomatoes are a must and eggs were also originally used, but you can try a vegan version (with tofu as an optional ingredient), too! If you would like to start closer to an original version, try this Yotam Ottolenghi’s or Mellissa Clark’s recipe. If you are ready for some experiments, check The Every Day Veggie or The Purple Carrot blog. Shakshuka can be also served for lunch. 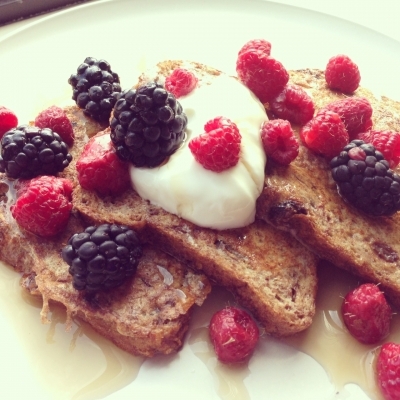 French toast is once again, a recipe which leaves room to experiment and suit to your preferences and taste. The basic recipe is simple (bread slices soaked in a mixture of beaten eggs and milk, fried in a pan and served with a bit of butter), but you can add fresh fruit and honey for a sweeter version or wilted spinach if you are a fan of more savory breakfast. Try using gluten-free bread (if you are allergic to this ingredient), swap regular milk for a vegetable-based one and/or skip eggs to discover new flavours and find your favourite way of preparing french toasts. French toast recipe must be the greatest for your breakfast.I have an got idea about french toast http://www.bestfrenchtoastrecipe.info/best-french-toast-recipe/. Looks delicious! Thank you for sharing, Phoebe!